Nagyon szépen köszönjük a csodálatos vendéglátást a hotel valamennyi dolgozójának. Bár az időjárás nem volt a legjobb mégis felejthetetlen három napot töltöttünk a hotelban feleségemmel és három unokámmal. Nagyon kedves, barátságos segítőkész személyzet, ízletes ételek. Hazautazásunk napján már eldöntöttük - " ide még jövünk "
One of the most important moments of our lives is wedding. It comes with a lot of excitement, planning and organizations. The location of the ceremony greatly influences the atmosphere of the event, so we truly recommend Döbrönte as a perfect place. Its rural romanticism, the ruins of the Himfy Castle as well as the services of Hotel Hasik provide an excellent location to enjoy the wedding. The hotel which is hidden at the ruins of the Himfy castle lies quite close to bigger towns and motorways. However, it is surrounded by a lovely, rural environment which is perfect for those who have decided to wed. Full support in the wedding preparations, organizing a romantic outdoor location as well as serving the whole menu of food and drinks are kindly provided by the hotel staff. After agreeing on the day of the wedding, the couple face a range of tasks to arrange out of which the hotel supplies the furniture and decoration, the whole menu of the reception, professional service as well as after-party accommodation for the young couple. The invited guests can take a rest in the hotel rooms while the more persevering can celebrate the couple until the small hours in the halls of the hotel. The next day, the young couple, their parents and relatives can use the wellness services of the hotel and they can begin this new phase of their life in a relaxed way. Those who have not yet been fully exhausted can participate in our various equestrian programmes. Since we owe several horses, the wedding can also be organized as a march with horses and carriages. 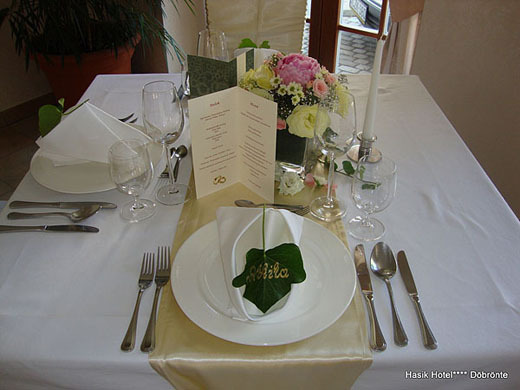 The helpful staff of the hotel is ready to arrange the difficult and tiresome tasks of the wedding preparations including the decoration of the indoor and outdoor locations, selecting and serving the menu as well as hosting the guests.